WASHINGTON — Naomi Abelson had always been curious about raising chickens. Before the 35-year-old lived in the D.C. region, her home was in New York City, where even entertaining the idea of having hens was out of the question. But when she moved to Takoma Park, Maryland, and read about a local company that rents chickens for weeks at a time, her interest resurfaced. “It sounded like a great way for me to just test the waters and see if this is something I wanted to do on a more permanent basis,” Abelson said. Earlier this summer, two egg-laying hens, their food and a chicken coop were delivered to Abelson’s backyard by RentACoop. For eight weeks, she is responsible for feeding the chickens, keeping their quarters clean and letting them out to roam. When her time is up, the hens will be picked up and returned to their home in Germantown, Maryland, where RentACoop founder Tyler Phillips takes care of them until it’s time for their next adventure. Phillips spent a few of his post-college years building and selling chicken coops, but decided to experiment with chicken rentals after seeing a spike in interest among city-dwellers and suburbanites. He said in addition to renting out chickens, providing everything one needs to care for the animals — a safe living space, food and detailed care instructions — takes a lot of the guesswork out about getting started. Delivering it all directly to the customer’s door makes the farm-like experience convenient. Phillips says a lot of his customers share Abelson’s curiosity and want to try chicken ownership on for size, but most come to him in search of a hands-on lesson for little ones. Having that experience is exactly why Miriam Feffer, of Northwest D.C., rented two hens from Phillips this summer. She says her 6-year-old daughter is an animal-lover, but keeping a pet in a busy household with two working parents isn’t an option right now. Collecting two fresh eggs every day is just an added bonus. 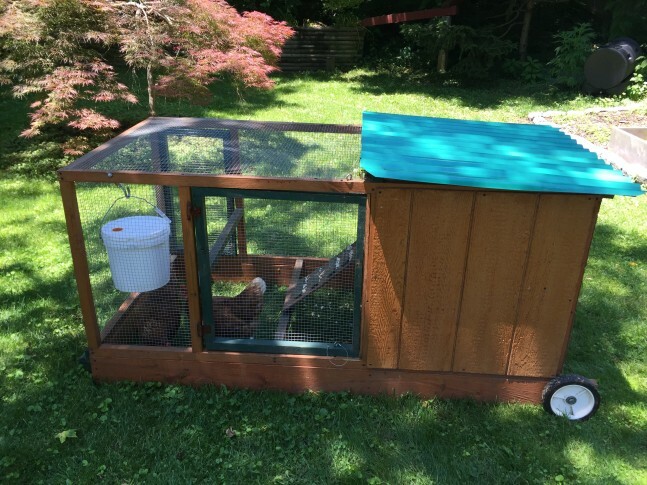 A four-week coop and hen rental from RentACoop costs $220. Adding on an additional four weeks is an extra $165. Feffer says her daughter has especially enjoyed naming the chickens and introducing them to her neighbors. “I’ve been recognized on the street a few times as something like the chicken lady,” she added. Both Abelson and Feffer say caring for the hens is relatively low-maintenance. The food needs to be filled once every two weeks and the water replaced once every 10 days. Ideally, they should be let out to wander for about an hour a day. Of course, the educational opportunity isn’t limited to kids who are learning to take on more responsibility. RentACoop also offers a four-week chicken-hatching program, which is especially popular with schools. DJ Schneider-Jensen, director of the Edlavitch-Tyser Early Childhood Center at the Washington Hebrew Congregation, has signed up for the hatching program for the past three years. Similar to the hen rentals, RentACoop drops off everything she needs for a four-week period, including seven fertile eggs, an incubator and two, just-hatched baby chicks for $200. Over the course of 21 days, Schneider-Jensen’s students watch the eggs change and develop with an egg-candling light. Then when the chicks hatch, they get a week or so to play with the new babies. Schneider-Jensen said the whole hatching experience teaches her 2- to 5-year-olds about empathy and how to be gentle with all creatures. “When you pull out the chicks, it’s very easy to squeeze one, and so we have to be very cautious and the children have to understand that the fur isn’t a strong body,” she said. “I think it’s also an opportunity for children to calm down when they come over to it because they feel like it’s a smaller child and they want to take care of it,” Schneider-Jensen said. When the program is over, the baby chicks return to Phillips’ land, where he cares for them until they are old enough to join the other 100-plus hens in the rental program. Because nearly all of his chickens start out being raised by children, they’re used to people. “[The kids] pet the chicks every day, they hold them, they let them sit on their shoulders, they run around the room and the chicks follow them, so all these hens were raised by kids … so these are all very friendly chickens,” Phillips said. Since he launched the business four years ago, Phillips said a number of similar models have opened across the country, and he expects the industry will continue to grow. Abelson and Feffer are nearing the end of their chicken rentals, and both said it was a positive experience. Phillips gives all of his customers the option to purchase their hens and the coop at the end of the rental, but Feffer said she’s fine giving Click and Cluck over to another family. “There’s something about that aspect of knowing that they’re ours for a time, but we’re not burdened with having to care for them forever, or stuck, it’s actually very freeing,” she said.